Another Rich and Decadent Dessert! 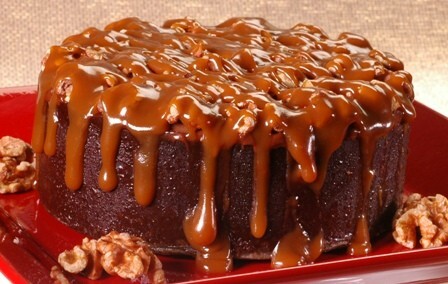 Roasted Walnut Caramel Fudge Cake....a flourless sinfully, decadent chocolate dessert! Our baked flourless cake is filled with our chocolate silk mousse topped with a thin layer of our dark chocolate silk. Roasted walnuts top this dessert with a layer of Yukon Jackson's famous artisan caramel. This dessert is so rich that our 6" dessert will serve 16 people and then some....a little bit of this one goes a long way!